All amazing ideas start with something that moves you, something that makes you want to shift beyond the status quo and do something different. And for Charlie Brackney and Jessica Reipke, co-founders of HAUS Salon in Minneapolis, that something brought them on a journey around the world, to work with hairdressers who fight domestic violence in Nu Po Refugee Camp in Thailand. It might be surprising to hear that one of the first businesses that pop up in refugee camps are barbers and hairdressers – the desire to look your best rings just as true for refugees. 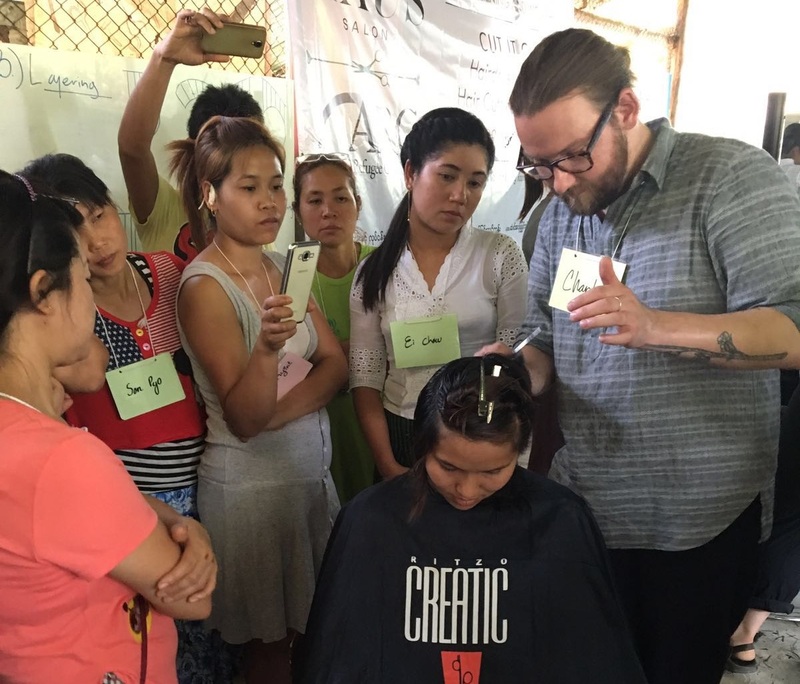 The American Refugee Committee’s project in Nu Po, called Cut it Out, trains hairdressers in the camp to recognize the signs of violence in their clients and help victims access services they need, like counseling and health clinics. It provides a new pathway for victims of intimate partner violence to get the support they need. Just as in the United States and many other countries around the world, salons are often natural places of information, places to receive and give advice. ARC has taken note of this phenomenon and channeled it to spread a message of anti-violence. Charlie and Jessica opened the first HAUS Salon in 2011, and quickly became one of the top salons in Minneapolis. They too recognize the power of salons to not only shape individual lives but whole neighborhoods, purposefully designing their spaces to promote conversation, community, and self-expression. Always committed to customer experience, they seek out some of the most talented and expertly trained artists in the Twin Cities. At Nu Po Refugee Camp: Phadkaew poses with Charlie from Haus Salon after he cut 1.5 feet of her hair! She’s donating the hair to be made into a wig for a cancer patient. HAUS’s introduction to the Cut it Out program at Nu Po came from an inside source – Charlie’s husband Brent Love works for ARC. 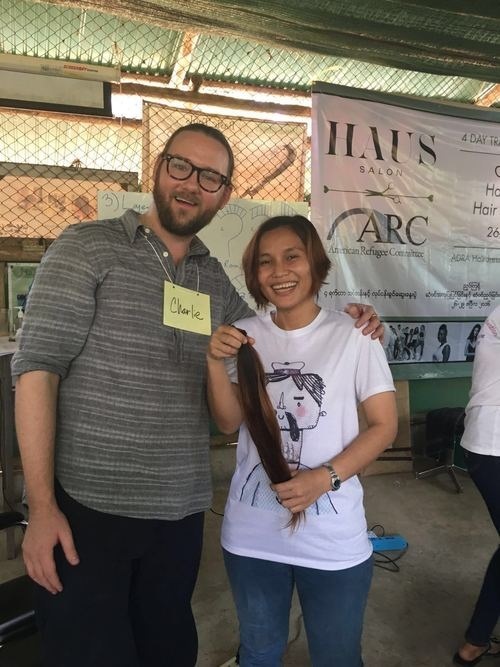 Charlie brought the idea for a collaboration to his team, which in turn ignited a spark in Jessica, and the rest of HAUS to join forces with ARC in Thailand. So, over the past several months, the HAUS team asked their clients to join them in giving – and raised an incredible $25,000 for the program. But, the journey didn’t stop there – it was only just beginning. This April, Charlie lead a team of five stylists who traveled to Nu Po to teach a workshop to refugee hairdressers on American haircutting techniques and strengthening business skills, setting the program up for success. While in the camp, they conducted a four-day hairdressing and hair cutting workshop for the hairdressers in Nu Po, teaching everything from haircutting techniques, finishing curling, braiding, and more. The anticipation and excitement about HAUS’s visit had been building for months – several of the staff in the camp grew their hair out specifically to help out as models for the workshop. And, the connection to their fellow stylists across the world was instantaneous. “It makes it so real,” said Charlie, of meeting the ARC staff and community whose work their fundraising efforts will directly impact. The team at HAUS has fostered meaningful friendships in Nu Po that will last a lifetime. They were moved by someone’s story and motivated to act, realizing in the process that they have the ability to change refugees’ lives on the other side of the globe. It’s people and groups like HAUS that are at the core of ARC’s work – catalyzing amazing people who want to put their unique skills and talents toward helping to solve some of the world’s toughest problems. HAUS has met their fundraising goal, but why stop now? They’ll keep donating to ARC as long as their clients and community are willing to give. To learn more about HAUS’s journey, visit their blog at www.haussalon.com/haus-arc.